"Chomp Chomp!" 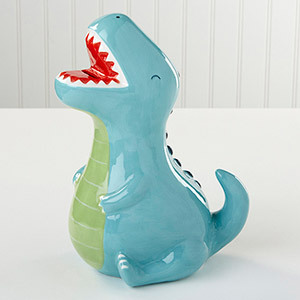 goes the dinosaur coin bank! 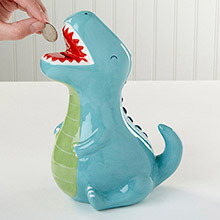 He opens wide, and your little one's precious pennies go inside! If you're looking for baby's first piggy bank gift for a birthday party or baby shower, you've found it here! This high quality Porcelain coin bank will look great in baby's nursery and is sure to be the best gift at the baby shower! 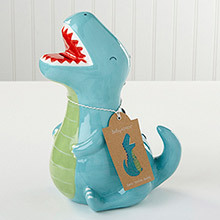 High quality Porcelain coin bank is a sitting teal T-Rex with a green textured belly, dark blue mane and white teeth. Bank is hand wash only. Measures 4.7" w x 6.3" d x 9.4" h.